The politics of Greece takes place in a parliamentary representative democratic republic, whereby the Prime Minister of Greece is the head of government, and of a multi-party system. Legislative power is vested in both the government and the Hellenic Parliament. Between the restoration of democracy in 1974 and the Greek government-debt crisis the party system was dominated by the liberal-conservative New Democracy (Νέα Δημοκρατία – Nea Dimokratia) and the social-democratic Panhellenic Socialist Movement (Πανελλήνιο Σοσιαλιστικό Κίνημα – Panellinio Sosialistiko Kinima, ΠΑΣΟΚ/PASOK). The Constitution of Greece, which describes Greece as a "presidential parliamentary republic", includes extensive specific guarantees of civil liberties and vests the powers of the head of state in a president elected by parliament. The Greek governmental structure is similar to that found in many other Western democracies, and has been described as a compromise between the French and German models. The prime minister and cabinet play the central role in the political process, while the president perform some executive and legislative functions in addition to ceremonial duties. Voting in Greece is compulsory but is not enforced. The Presidential Mansion, previously the Crown Prince's palace. 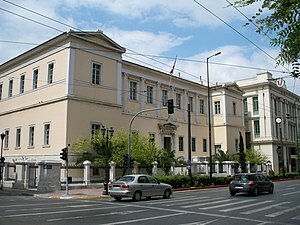 Maximos Mansion, the official seat of the Prime Minister of Greece. The Cabinet of Greece, which is the main organ of the government, includes the heads of all executive ministries, appointed by the president on the recommendation of the prime minister. The President of the Republic is elected by the Parliament for a five-year term (election last held 13 March 2015), and a maximum of two terms in office. When a presidential term expires, Parliament votes to elect the new President. In the first two votes, a ​2⁄3 majority (200 votes) is necessary. The third and final vote requires a ​3⁄5 (180 votes) majority. If the third vote is fruitless, Parliament is dissolved and elections are proclaimed by the outgoing President within the next 30 days. In the new Parliament, the election for President is repeated immediately with a 3/5 majority required for the initial vote, an absolute majority for the second one (151 votes) and a simple majority for the third and final one. The system is so designed as to promote consensus presidential candidates among the main political parties. The president has the power to declare war, to grant pardon (forgiveness) and to conclude agreements of peace, alliance, and participation in international organizations; upon the request of the government a simple parliamentary majority is required to confirm such actions, agreements, or treaties. An absolute or a three-fifths majority is required in exceptional cases (for example, the accession into the EU needed a 3/5 majority). The president can also exercise certain emergency powers, which must be countersigned by the appropriate cabinet minister. The president may not dissolve parliament, dismiss the government, suspend certain articles of the constitution, issue a proclamation or declare a state of siege without countersigning by the prime minister or the appropriate cabinet minister. To call a referendum, he must obtain approval from parliament. The prime minister is elected by the Parliament and he or she is usually the leader of the party controlling the absolute majority of MPs. According to the Constitution, the prime minister safeguards the unity of the government and directs its activities. He or she is the most powerful person of the Greek political system and recommends ministers to the President for appointment or dismissal. 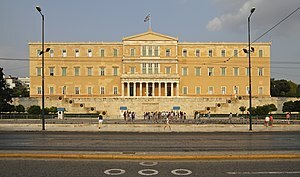 Greek parliamentary politics hinge upon the principle of the "δεδηλωμένη" (pronounced "dhedhilomeni"), the "declared confidence" of Parliament to the Prime Minister and his/her administration. This means that the President of the Republic is bound to appoint, as Prime Minister, a person who will be approved by a majority of the Parliament's members (i.e. 151 votes). With the current electoral system, it is the leader of the party gaining a plurality of the votes in the Parliamentary elections who gets appointed Prime Minister. An administration may at any time seek a "vote of confidence". Conversely a number of Members of Parliament may ask that a "vote of reproach" be taken. Both are rare occurrences with usually predictable outcomes as voting outside the party line happens very seldom. On 4 October 2009, George Papandreou, president of the Panhellenic Socialist Movement party and son and grandson of Prime Ministers, was elected as the new Prime Minister of Greece, following five years of government under New Democracy leader Kostas Karamanlis, the nephew of long-time Prime Minister and President Konstantinos Karamanlis. The Greek Parliament building, which was the Old Royal Palace. Greece elects a legislature by universal suffrage of all citizens over the age of 18. The Greek Parliament (Βουλή των Ελλήνων) has 300 members, elected for a four-year term by a system of reinforced proportional representation in 48 multi-seat constituencies, 8 single-seat constituencies and a single nationwide list. 288 of the 300 seats are determined by constituency voting, and voters may select the candidate or candidates of their choice by marking their name on the party ballot. The remaining 12 seats are filled from nationwide party lists on a top-down basis and based on the proportion of the total vote each party received. Greece uses a complex reinforced proportional representation electoral system which discourages splinter parties and makes a parliamentary majority possible even if the leading party falls short of a majority of the popular vote. Under the current electoral law, any single party must receive at least a 3% nationwide vote tally in order to elect Members of Parliament (the so-called "3% threshold"). The largest party gets a 50-seat bonus (out of 300 seats) ostensibly to ensure elections return viable governing majorities. The law in its current form favors the first past the post party to achieve an absolute (151 parliamentary seats) majority, provided it receives a 41%+ nationwide vote. This is touted to enhance governmental stability. The electoral law can be changed by simple parliamentary majority, but a law so changed only becomes enforced in the election following the upcoming one, unless it is voted by the Greek Parliament with a majority of ​2⁄3 of the total number of the deputies. 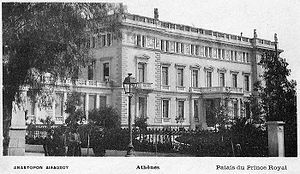 The building of the Arsakeion in Athens, where the Council of State is seated. In Greece the judicial branch is divided into civil, and administrative courts. Civil courts judge civil and penal cases, whereas administrative courts judge administrative cases, namely disputes between the citizens and the State. The judicial system of Greece comprises three Supreme Courts: the Court of Cassation (Greece) (Άρειος Πάγος), the Council of State (Συμβούλιο της Επικρατείας) and the Chamber of Accounts (Ελεγκτικό Συνέδριο). These high courts are composed of professional judges, graduates of the National School of Judges. The way the judges are gradually promoted, until they become members of the Supreme Courts, is defined by the Constitution and the existing laws. The presidents and the vice-presidents of the three Supreme Courts are chosen by the Cabinet of Greece among the serving members of each of the Supreme Courts. The Court of Cassation is the supreme civil and penal court, whereas the Council of State is the supreme administrative court. The Chamber of Accounts has an exclusive jurisdiction over certain administrative areas (for example it judges disputes arising from the legislation regulating the pensions of civil servants) and its decisions are irrevocable. This means that they are not judged at second instance by the Council of State. Sometimes, the Supreme Courts take contradictory decisions or they judge differently the constitutionality of a legal provision. These disputes are resolved by the Supreme Special Court, whose composition and jurisdiction is regulated by the Constitution (article 100). As its name reveals, this court is not permanent and it sits when a special case belonging to its jurisdiction arises. When the Supreme Special Court sits, it comprises eleven members: the Presidents of the three Supreme Courts, four members of the Court of Cassation and four members of the Council of State. When it judges the constitutionality of a law or resolves the disputes between Supreme Courts, its composition comprises two more members: two professors of the Law Schools of Greece. The Supreme Special Court is the only court which can declare an unconstitutional legal provision as "powerless" (something like "null and void"), while the three Supreme Courts can only declare an unconstitutional legal provision as "inapplicable" to that particular case. The Supreme Special Court is also the Supreme Electoral Court, judging pleas against the legality of the legislative elections. Greece is divided in 13 regions, further divided into 74 regional units. The prefectures are each headed by a prefect (the "Nomarch"), who is elected by direct popular vote. The thirteen regional administrative districts (peripheries), each including a number of prefectures are headed by a regional governor (the "Peripheriarch"), appointed by the Minister of the Interior. In northern Greece and in greater Athens, three areas have an additional administrative position between the nomarch and peripheriarch. This official, known as the Chair of the prefectural local authorities or "superprefect" (the "Hypernomarch"), is elected by direct popular vote together with the nomarchs she or he supervises. Although municipalities and villages have elected officials, they do not have an adequate independent revenue base and must depend on the central government budget for a large part of their financial needs. Consequently, they are subject to numerous central government controls. This also leads to extremely low municipal taxes (usually around 0.2% or less). As one of the oldest Euro-Atlantic member states in the region of Southeast Europe, Greece enjoys a prominent geopolitical role, due to its political and geographical proximity to Europe, Asia, the Middle East, and Africa. Its main allies are France, Italy, Bulgaria, United States, the other NATO countries like Albania, and the European Union. Greece also maintains strong diplomatic relations with Cyprus, Albania, Russia, Serbia, Armenia and Israel, while at the same time focuses at improving further the good relations with Egypt and the Arab World, Caucasus, and China. As member of both the EU and the Union for the Mediterranean, Greece is a key player in the eastern Mediterranean region and has encouraged the collaboration between neighbors, as well as promoting the Energy Triangle, for gas exports to Europe. Greece also has the largest economy in the Balkans, where it is an important regional investor. Under the Greek constitution, education is the responsibility of the state. Most Greeks attend public primary and secondary schools. There are a few private schools, which must meet the standard curriculum of and are supervised by the Ministry of Education. The Ministry of Education oversees and directs every aspect of the public education process at all levels, including hiring all teachers and professors and producing all required textbooks. A recent issue concerning education in Greece is the institutionalisation of private universities. According to the constitution only state-run universities operate on the land. However, in the recent years many foreign private universities have established branches in Greece, offering Bachelor's level degrees, thus creating a legal contradiction between the Greek constitution and the EU laws allowing foreign companies to operate anywhere in the Union. Additionally, every year, tens of thousands of Greek students are not accepted to the state-run University system and become "educational immigrants" to other countries' Higher Education institutions, where they move to study. This has created a chronic problem for Greece, in terms of loss of capital as well as human resources, since many of those students opt to seek employment in the countries they studied, after completing their studies. It is characteristic that in 2006, Greece, with 11.5 million inhabitants, was fourth in the world in terms of student export in absolute numbers, with 60,000 students abroad, while the first country in this regard, People's Republic of China of over 1,3 billion inhabitants, had 100,000 students abroad. In terms of students abroad as a percent of the general population, Greece is by far the leading country, with 5,250 students per million, compared to second Malaysia's 1,780 students per million inhabitants. Citing these problems as a result of the state's monopoly on Higher Education, New Democracy (ND) committed to amending the constitution, in order to allow private universities to operate in Greece on a non-profit basis. This proposal was rejected by then-ruling Panhellenic Socialist Movement (PASOK) in the late nineties, and thus could not muster the support necessary to be put to vote on the constitutional amendment of 2001. However, PASOK has since changed its stance, and now also supports a constitutional provision for the creation of private Universities on a non-profit basis. This proposal continues to encounter the fierce opposition of the Left parties and part of the academic community, both professors and students. At the outset of 2006, prime minister Kostas Karamanlis announced the initiative of his government for a new amendment of the Constitution. According to his assertion one of the main issues of this amendment (the second within less than 10 years) is going to be the creation of "non-state owned" universities. Greece has problems with illegal immigration, especially from or via Turkey. Greek authorities believe that 90% of illegal immigrants in the EU enter through Greece, many fleeing because of unrest and poverty in the Middle East and Africa. Several European courts have held that Greece is not complying with minimum standards of treatment for asylum seekers, so that illegal migrants who reach other countries cannot be sent back to Greece. One of the main problems of the system is the long-time process needed, even for a simple case, something that negatively impacts investment, entrepreneurship, social relations, corporate governance, and public governance. Also corruption cases have appeared during the last years, such as the Paradikastiko organization scandal. There are four distinct prison types in Greece. The first one is a special detention premises for adults called Agricultural Prisons. Agricultural prisons include 3 prisons and a warehouse. The second prison type is a special detention premise for young people, which includes three separate locations. The third prison type is a therapeutic premise, which includes a hospital, a psychiatric area, and a rehab facility. The last of the four prison types is for detention purposes. The total number of detention centers within Greece is twenty-two. Within these centers the percentage of female prisoners is 5.5%, which amounts to around 538 female prisoners. The percentage of juveniles in Greek prison is 2.9%. Greece’s occupancy rate in prisons is 99%, which means that Greece’s prisons are near full capacity. Because of this the Greek Justice Ministry and the European Council want to improve Greek prison conditions. These improvements include training for guards, improving of medical facilities, and better treatment of prisoners. These selected improvements are three human rights that the Greek correctional system would like to tackle. The Greek media, collectively, is a very influential institution – usually aggressive, sensationalist. As with many countries, most of the media are owned by businesses with commercial interests in other sectors of the economy. There are often accusations of newspapers, magazines, and radio and television channels being used to promote their commercial enterprises as well as to seek political influence. In 1994, the Ministry of Press and Media was established to deal with media and communication issues. ERT S.A., a public corporation supervised by the Minister of Press, operates three national television channels and five national radio channels. The Minister of Press also serves as the primary government spokesperson. The Secretary General of Press and Information prepares the semi-official Athens News Agency (ANA) Bulletin. Along with AP and Reuters, this is a primary source of information for the Greek press. The Ministry of Press and Information also issues the semi-official Macedonian News Agency (MPE) Bulletin, which is distributed throughout the Balkan region. For international news, CNN is a particular influence in the Greek market; the major television channels often use it as a source. State and private television stations also use Eurovision and Visnews as sources. While few papers and stations have overseas correspondents, those few correspondents abroad can be very influential. In 1988, a new law provided the legal framework for the establishment of private radio stations and, in 1989, private television stations. According to the law, supervision of radio and television is exercised by the National Radio and Television Council. In practice, however, official licensing has been delayed for many years. Because of this, there has been a proliferation of private radio and television stations, as well as European satellite channels, including Euronews. More than 1,000 radio stations were operating before March 2002, when the government implemented plans to reallocate television frequencies and issue licenses as authorized by the 1993 Media Law, effectively reducing this number. In 2011, the government proposed new measures that will restrict the freedom of speech in the internet. According to some proposals, every individual who would like to use free platforms, such like Blogspot or WordPress.com will be forced to get officially registered in the courts, as due to tough austerity measures web sites that criticize the government and the political system in general have been multiplied. Press freedom sharply eroded in Greece during the economic and financial crisis of 2010–2015, passing from the 35th place in 2009 in Reporters Without Borders Press Freedom Index to the 99th place in 2014, well below all Western Balkans countries as well as states with repressive media policies such as Gabon, Kuwait or Liberia. Greece is today the EU member state "where journalism and the media face their most acute crisis". Nine months for all males of 18 years of age; Compulsory with fines and imprisonment if denied, but neither fine nor imprisonment has been imposed since 1994, where the last warrant against a draft-dodger was issued. Members of families with three children serve a reduced time of six months. Military service can also be substituted with a longer public service, which by the standards of Amnesty International, ought to be considered punitive as it is twice as long as the regular tour of duty. Limited steps have been taken to turn the Greek military into a semi-professional army in the last years, leading to the gradual reduction of the service from 18 to 12 to 9 months and the inclusion of a greater number of professional military personnel in most vertices of the force. Recent developments, though, within the anti-conscription movement in Greece, such as the high death rate from suicides during service and work-related accidents, such as the Manitsa incident, combined with a high rate of draft-dodging, have advanced the idea that mandatory conscription should be abolished and an all-professional/all-volunteer army should be put in place. Greece directs approximately 1.7% of its GDP to military expenditures, the 7th highest percentage in Europe. In absolute numbers the Greek military budget ranked 28th in the world in 2005. By the same measure, Greek military budget ranked 6th in the Mediterranean basin (behind France, Italy, Turkey, Israel and Spain) and 2nd (behind Turkey) in its immediate vicinity, the Balkans. Greek arms purchasing is among the highest in the world: Greece ranked 3rd in the world in 2004. These figures are explained in the light of the arms race between Greece and Turkey with key issues being the Cyprus dispute and disagreement over sovereignty of certain islets of the Aegean. For more information see Greco-Turkish relations. Conversely, the foreign relations of Greece as well as many internal policy decisions are largely affected by its arms purchases. The United States, being the major arms seller to Greece has been known to actively intervene in military spending decisions made by the Greek government. The US has at times actively stepped in to help avoid large scale crisis, as in the case of the Imia-Kardak crisis. The reduction of military spending has long been an issue in Greek politics. The former prime minister, Kostas Karamanlis had proposed a reduction to military spending through a "Defence Eurozone", referring to the European Security and Defence Policy. The previous PASOK administration, also planned on reducing military spending prior to its failure to be re-elected in 2004, while PASOK politicians usually refer to money saved from reducing military spending as a "peace dividend" ("μέρισμα ειρήνης"). Some of the parties on the left, such as the Communist Party of Greece and Synaspismos, have been vocal in condemning military spending. Regarding the purchase of 30 F-16 and 333 Leopard tanks in 2005, both parties criticized the New Democracy administration for spending money on weapons while doing nothing to relieve the lower classes and said that high military spending "does not correspond to the real needs of the country but is carried out according to NATO planning and to serve weapon manufacturers and the countries that host them". The Greek Orthodox Church is under the protection of the State, which pays the clergy's salaries, and Orthodox Christianity is the "'prevailing" religion of Greece according to the Constitution. The Greek Orthodox Church is self-governing but under the spiritual guidance of the Ecumenical Patriarch in Constantinople. Freedom of religious beliefs is guaranteed by the Constitution, but "proselytism" is officially illegal. According to the most recent Eurostat "Eurobarometer" poll, in 2005, 81% of Greek citizens responded that "they believe there is a God", whereas 16% answered that "they believe there is some sort of spirit or life force" and only 3% that "they do not believe there is a God, spirit, nor life force". This would make Greece one of the most religious countries in the European Union of 25 members, after Malta and Cyprus. The Muslim minority, concentrated in Thrace, was given legal status by provisions of the Treaty of Lausanne (1923) and is Greece's only officially recognized religious minority. There are small Roman Catholic communities on some of the Cyclades and the Ionian Islands, remnants of the long Venetian rule over the islands. The recent influx of (mostly illegal) immigrants from Eastern Europe and the Third World has an expectedly varied multi-religious profile (Roman Catholic, Muslim, Hindu etc.). During the 2001 constitutional amendment, complete separation of church and state was proposed, but the two major parties, ND and PASOK, decided not to open this controversial matter, which clashes with both the population and the clergy. For example, numerous protests occurred over the removal of the Religious Denomination entry from the National ID card in 2000. ^ Article 16 of the Constitution of Greece. ^ Article 16 of the Constitution of Greece, Section 5: "Education at university level shall be provided exclusively by institutions which are fully self-governed public law legal persons". ^ US Arms Clients Profiles – Greece: "The Greek publication Elevtherotipia reported that former Ambassador Nicholas Burns had taken part in attempting to dissuade Greek officials from purchasing the Eurofighter in favor of a U.S. military aircraft." Wikimedia Commons has media related to Politics of Greece.